I’ve been super curious about Elusion for a while now. I was definitely drawn in by the stunning cover, and I was looking to see if the story was just as great. The story definitely does not disappoint. Elusion, a device that can transport you to any exotic destination of your choice for a quick escape from reality, is the hottest new technology on the market. Regan’s father and best friend, Patrick, worked for a long time to perfect this device, so that it could be released nationwide. But after her father’s tragic death, and rumors of the device failing, it’s up to Regan to find out what’s really going on. The main character in the novel was Regan. I found her to be a very determined young lady. She knew the difference between right and wrong, and she was willing to stand up for what she believed in—even when sometimes her beliefs weren’t actually the right ones. I really liked her determination to find out what was going on. There were two boys in the novel, Josh and Patrick, but I hesitate to say that it was a love triangle. Yes, both boys had feelings for Regan, but I didn’t exactly feel that she reciprocated those feelings. And honestly, I didn’t really feel like either boy was right for her anyways. If I had to pick one, it would probably be Josh. But that may change in the future. The world-building for the book was really interesting. This is not a world like we know it. This is a world that has major air pollution problems, smog, and even acid rain. People have to wear breathing masks when they go outside just so that they don’t inhale the polluted air, and use special treated umbrellas in the rain. This is the whole reason that Regan’s dad created Elusion. Things were so bad in the dad-to-day life; he just wanted to have a place for people to go to escape their troubles for a while. It was a great idea; it just fell into the wrong hands, so to speak. What I really liked about this book was that I can see something like what happened in the book happening in real life. Not only with the technology, but also the way people can become so absorbed with it. I thought it was very realistic the way people reacted to the device. 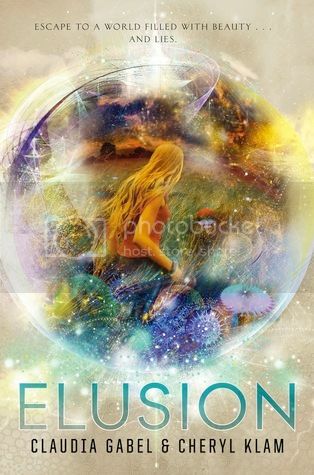 At first I thought that Elusion was going to be a stand-alone novel, but after the mild cliffhanger ending at the end of the book, I see that there must be a sequel in the future. For this I am glad, because there were a lot of things left unresolved at the end of the novel, and I’m itching to know what’s going to happen with these characters. Overall, this was a very interesting book to read. I enjoyed reading it, and I am really looking forward to reading the next book. I’m also super curious to see how many books are going to be in this series. The worldbuilding sounds really interesting! I think I have this on my Kindle...I need to read it. This really sounds like interesting worldbuilding! I'd have to be in a certain mind to read it or I'd get to freaked out thinking that something like the world getting that bad could possibly happen! You've got me curious, though! I may brave this one soon!